The VGA PS/2 KVM extender provides local and remote audio, KVM (PS/2 keyboard, PS/2 mouse and VGA monitor) access to a PC up to 300 feet using CAT5/5e/6/6a UTP cable. 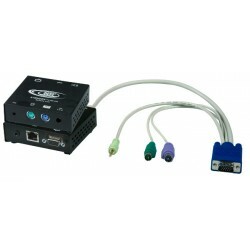 Local unit provides local KVM access and audio. Supports a PC or SUN Fire™ V20z. Male 15-pin HD/male 6-pin miniDIN connectors for PC. 3.5 mm stereo plug for stereo audio input. 3.5 mm stereo jack for stereo audio output. 3.5 mm stereo audio jack for audio output.